I am not ashamed to report to you that a few minutes before I wrote this blog post I was in tears—tears of joy that is! These tears were triggered when Amazon delivered to my mailbox my very own copy of the newly published bombshell—the first of its kind ever—The Jesus Bible. During those emotional moments I kept recalling a scene from C. S. Lewis’s The Lion, the Witch and the Wardrobe. Aslan, the previously expelled lion-king, has just returned to his ancient dominion, Narnia. However, he has done so secretly. The only evidence he is back, roaming his land in preparation for retaking his throne, is that gradually the incessant snow of an unending winter—a spell placed on the kingdom by an evil witch—is beginning to thaw. Trickles of water are seen here, a flower popping through the snow there; a songbird reappears, serenading nearby. These and other signs bring a promise of the end of the long winter. Similarly today, though currently unnoticed by most believers, signs are emerging that presage—as my friend, seminary professor Richard Ross, so often reminds me—that in whole new ways Aslan (the Lord Jesus) is moving in our land once again. The Jesus Bible is now part of this unfolding drama. What makes this so exciting is that this volume is one more piece of evidence of how the Holy Spirit is actively breaking up the old frozen ground in our churches and in our hearts. In recent years the Church has begun to enter a “thawing season.” There is evidence everywhere that our Lord Jesus is roaming among his people to bring us back to himself and to the fullness of all he is as he reigns at God’s right hand. The full force of this “Christological reformation,” this Christ Awakening movement, has not yet broken in upon us, to be sure. The sweeping changes inherent in a Spirit-initiated reintroduction (reconversion?) of God’s people to God’s Son in the full wonder of his majesty and sovereignty remains at hand. But nevertheless, a pervasive “thawing” of the Church has begun. It is a thawing that ultimately will lead to the unmistakable deliverance of God’s people from the icy grip of the crisis of Christology that has paralyzed us far too long. It is a thawing that will usher us into the mobilization of the Church for the sake of Christ’s global cause as it becomes thoroughly Person-driven like never before. This is the thawing that has begun in answer to years of prayer by a multitude of believers across our nation and beyond. Our eyes are witnessing the sure, steady unfolding of a grand work of revival for which many generations have longed. Can Springtime Be Far Behind? ChristNow.com is one example that the thaw is fully under way. If you knew the story behind it you would know that its very existence springs from a series of miracles. By the hand of God something that has never existed before in the life of the Church now waits to serve you. But we believe the Spirit has brought this website forth not primarily for this hour but rather in view of what is yet to come in the life of the Church for the glory of the Head of the Church. It is both a sign and a servant of a spiritual springtime that will saturate our generation with the saving glory of the Lord Jesus Christ. So is the newly published The Jesus Bible. 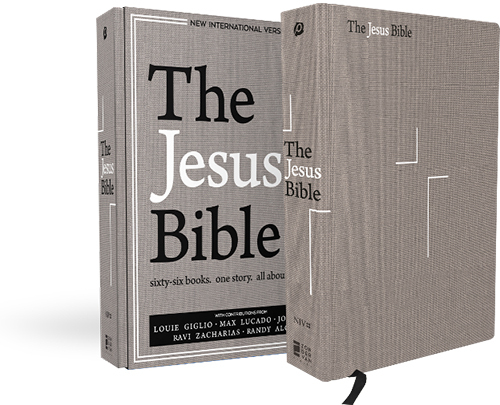 This massive undertaking to create a new kind of study Bible (based on the widely used NIV translation of the Scriptures) gives us a resource that has never existed before in the history of the Church. I would use descriptive words like these: Remarkable. Incredible. Seismic. Beginning with its general editor, Louie Giglio, the book incorporates the labors of scores of Christian leaders intent on providing commentary that will allow God’s Word to drive God’s people into the arms of God’s Son, page after page after page. Nearly 2000 pages in length (! ), it offers readers a rich tapestry woven with truths and insights about the person of Jesus from cover to cover—foreshadowed in the Old Testament and displayed in fullness in the New Testament. I predict that as The Jesus Bible becomes more and more popular, used regularly by Christian leaders (clergy and lay) in their ministries, it will reshape the focus and content and application of sermons, Sunday school classes, small group Bible studies, even personal devotions, everywhere. Now, it may be that as I work my way through this volume over the next few months, I’ll discover at some points that it falls short of emphasizing more specifically the supremacy of Christ the way I do in my personal two-decades-old “Regal Bible” (as I call it) in which, using a yellow highlighter, I’ve marked hundreds of passages that can help people see more clearly the greatness and majesty and sovereignty of the Lord Jesus. Nearly 65% of my Bible has turned yellow! Still, without a doubt, The Jesus Bible is a monumental step in the right direction, like nothing that has ever been published before. The Thaw Has Begun! So Abound in Hope! So, to those of us who long to see God’s Son more fully exulted in and exalted by his people everywhere, let us not grow weary. Our prayers and labors to foster and serve the Christ Awakening movement that must come will not prove to be in vain. Truly, that glorious breakthrough IS coming. Against all hope, Abraham in hope believed . . . he did not waver through unbelief regarding the promise of God, but was strengthened in his faith and gave glory to God, being fully persuaded that God had power to do what he had promised (NIV). Let’s continue to follow Jesus with the hope of Abraham—now more than ever—because already the thaw is under way!